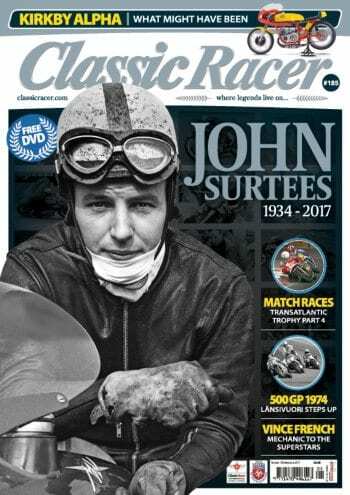 As a reader of Classic Racer you need no introduction as to who Mr Surtees was and what he achieved. If you’ve picked this up as your first taste of this magazine then the man who won seven motorcycle GP world championships and also went on to take the F1 crown, is the focus of much of this episode of the classic racer world for good reason. Corners of the paddock and global events scoured and reported on by our Malcolm as he continues to deliver the news that matters about the people who live motorcycles. 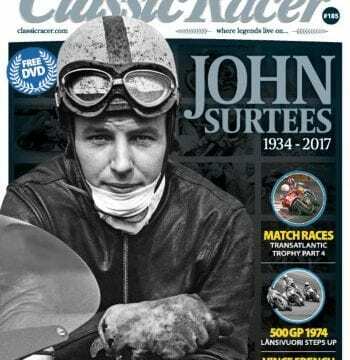 As one might expect, many memories of Mr Surtees have arrived at Classic Racer headquarters, all of which have – without exception – espoused the many positives his actions brought not only to motorcycle racing but also Britain. Here’s a selection of some of the missives we have received. When he had a telephone call from Mr Harley and Mr Davidson, inviting him to race for them in the 1940s, Paul Goldsmith knew he had arrived. Goldsmith is an AMA Motorcycle Museum Hall of Fame resident, a Daytona 200 winner and a five-times AMA Nationals winner. But it’s his memories of racing on a shifting sands beach course whilst battling other riders and an incoming tide that will stick in your mind. From a racing start to spinning the spanners for some of the biggest names in racing history, French was one of the most influential and instrumental people in racing’s past. Here’s his story and an explanation of why many big names owe this particular man a lot. It had been a difficult meeting for some, but in Sweden it was home hero Lansivuori who found the top step of a memorable 500cc race. Jan Burgers explains what happened. In to the 1980s and the last events of the GB v USA series. Future and current GP stars from both sides of the pond, upcoming young guns looking to establish themselves and incredible races from start to finish were a fine epitaph for the TT races. In 1968, Lincolnshire’s John Kirkby mated an ex-Tom Philips Vio Camp Ducati chassis to a 247cc disc valve vertical two-stroke twin from Alpha Automotive of Dudley. The result is exquisite. Graham Lawlor and Russ Lee were in attendance at the opening CRMC event in the flatlands of Norfolk. Here’s their report on the event.